This 1869 baseball card is considered to be one of the first baseball cards ever made. It was found accidentally by a 72-year-old woman from California who originally listed it on eBay just for $10 dollars. After bidders showed an unusual interest, she withdrew it and it eventually sold it at auction for more that $75,000 dollars. While the date of the absolutely oldest card is uncertain, what is believed by many collectors to be the first true mass-produced baseball card was created in 1869 by the Peck & Snyder Sporting Goods Company of 124-128 Nassau Street in Manhattan. The company was founded in 1866 by Andrew Peck and Irving Snyder, who sought to capitalize on a growing interest in sports by an America that was exhausted from the Civil War. Baseball and photography were both in their infancy; newspapers were not printing advertising photographs yet, and Peck & Snyder, like many other mid-Victorian businesses, advertised themselves by mass-producing trade cards to give out. 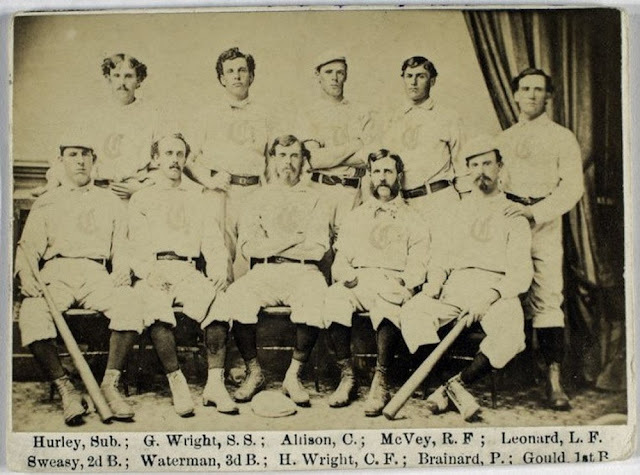 In 1869, the company printed trade cards, in bright red lettering, with a team photo of the undefeated Cincinnati Red Stockings, the pioneering professional team. There were several varieties of the card; in the most sought-after, the players’ names were printed beneath the photo. They posed in their uniforms and bootlike shoes, and held bats, but there were no gloves yet. Depending, as always with collectibles, on their condition, the few surviving 1869 Red Stockings cards can be worth a small fortune. In 2009, a card found in an odd lot by an antiques dealer in Fresno, Calif., Bernice Gallego, sold for more than $75,000. Ms. Gallego, who had never seen a baseball game, initially offered the card for $10 on eBay, but withdrew it after bidders showed unusual interest. The Peck & Snyder company prospered, branched out to other sports, especially bicycling, and was later sold to the Chicago sports equipment maker A. G. Spalding, the former player and team executive.